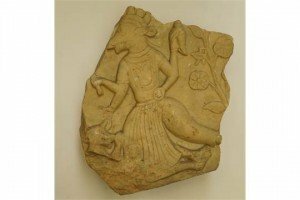 An Indian fragmentary marble panel of Varaha, carved in relief, with multiple arms, a conch shell in his hand, wearing jewellery and a flowing dhoti, his enemy crushed beneath his feet. 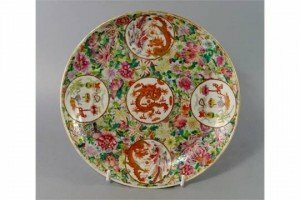 A large Chinese porcelain famille rose medallion dish, Guangxu mark and period, set with five medallions painted with dragons, phoenix and auspicious objects on a millefleurs ground, with traces of gilt to rim and painted to the underside with chrysanthemum blossoms. 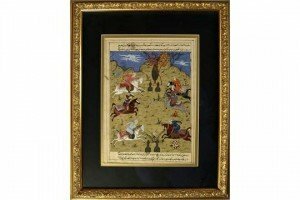 A Persian illuminated manuscript leaf, late 19th/20th century, the main panel of noblemen playing polo, between lines of calligraphy. 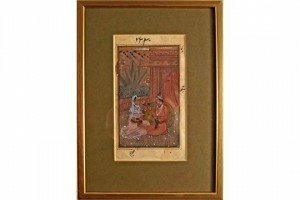 An Indian miniature painting of a couple seated, 19th/20th century, on flowers to floor and landscape behind, opaque watercolour on paper. 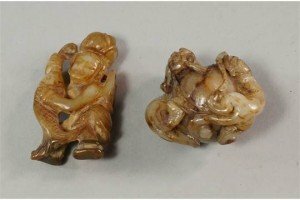 A Chinese jade model of a boy with a fish, a lotus flower on his head, 20th century, 6cm high, together with a Chinese hard stone carving of a ball with a chi dragon wrapped around its form. 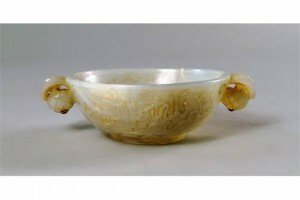 A Mughal agate circular dish, with two ruby set fruit finial, carved to the exterior with two cartouches of calligraphy, above a band of stiff leaves. 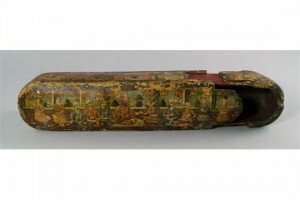 A large Persian lacquered qualandam, 18th/19th century, the top decorated with a scene of a Sultan with his retinue in an interior with windows behind and carpets to the floor, with conforming decoration to the sides. 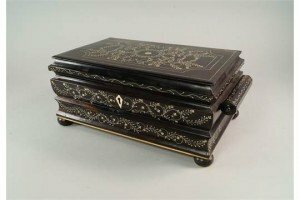 An Anglo Indian hardwood ivory inlaid rectangular work box, early 20th century, the hinged lid decorated with entwined floral motifs, enclosing fitted interior with spool reel, pin cushion and four lidded compartments, raised on squat bun feet. 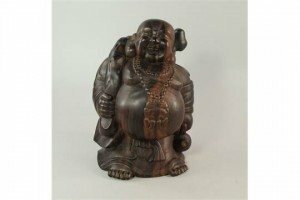 A Chinese carved wood model of an Immortal, 20th century, probably Hotei Buddha, carrying a wooden club. A pair of diamond and gem-set ear pendants. Each designed as a brilliant-cut diamond collet with a green-gem surround, to the brilliant-cut diamond line surmount. Estimated total diamond weight 1.40cts. 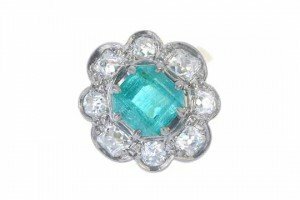 An emerald and diamond floral cluster ring. 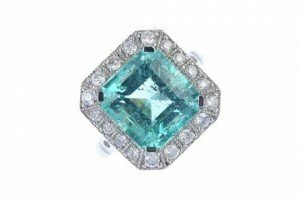 The square-shape emerald, within an old-cut diamond scalloped surround, to the plain band. An emerald and diamond ring. The square-shape emerald, within a brilliant-cut diamond surround, to the openwork and grooved detail sides. 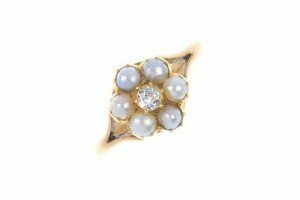 An early 20th century 9ct gold diamond and split pearl cluster ring. The old-cut diamond, within a split pearl surround, to the bifurcated shoulders and plain band. 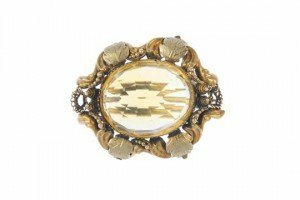 A late 19th century 19ct gold citrine brooch. The oval-shape citrine, within a textured foliate and scrolling surround. 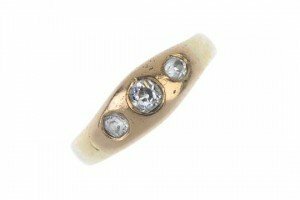 An early 20th century 18ct gold diamond three stone ring. The graduated old-cut diamonds, inset to the plain band. Estimated total diamond weight 0.30ct. 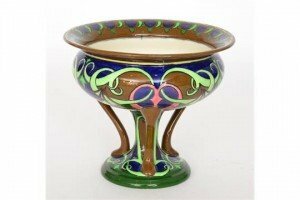 A late Foley Shelley Intarsio pedestal bowl decorated in the Art Nouveau style with repeat pattern motif to a brown and green ground. 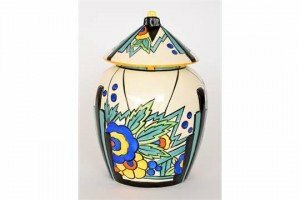 A 1930s Art Deco Thomas Forrester & Sons Phoenix Syrian pattern vase and cover, the ovoid body and domed cover with geometric and abstract motif to a white ground. 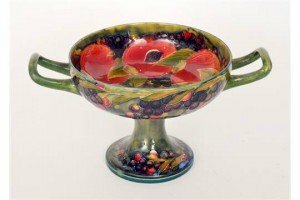 A William Moorcroft twin handled pedestal bowl decorated in the Pomegranate pattern, the interior with whole and open fruits and berries against a green ground, the exterior and foot with berries and foliage, signed in green. 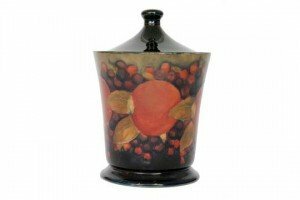 A William Moorcroft cylindrical box and domed cover decorated in the Pomegranate pattern with a band of whole fruit and berries. 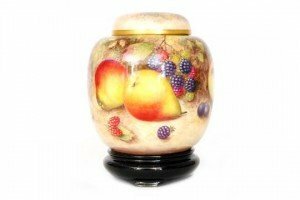 A Royal Worcester fruit painted ginger jar and cover decorated in the round by Harry Ayrton with hand painted apples, grapes, peaches and berries, all to a mossy ground.